Essential tremor is the most common movement disorder – it’s even more prevalent than Parkinson’s disease — and although many cases are mild, others can become quite debilitating over time. The tremors, which are often most severe in the hands, can interfere with everyday activities such as eating, drinking, writing, or tying shoelaces. Tremors also commonly affect the neck and head, causing the shaking that plagued the late actress Katharine Hepburn. Yesterday I became the first doctor in New York to perform an exciting new procedure on a patient with essential tremor, using high-intensity focused ultrasound to target the source of the tremors. I’m happy to report that the patient did extremely well, and the surgical team watched throughout the procedure as his tremor diminished visibly before our eyes. Focused ultrasound takes advantage of a technology that has been successfully used to treat uterine fibroids and breast and prostate cancer, but of course any procedure involving the brain is far more complicated than treating any other part of the body. Ultrasound waves have been shown to be benign in the body, but they normally scatter when passing through the skull. The new procedure relies on magnetic resonance imaging (MRI) to pinpoint the exact location in the brain responsible for the tremor, then uses MRI guidance to focus the many ultrasound waves on that location. In yesterday’s procedure, the patient was fitted with a helmet that held an array of 1,000 sources of ultrasound energy, each beam so small and low-energy that it passed harmlessly through healthy brain tissue on its way to the lesion that was causing the tremor. 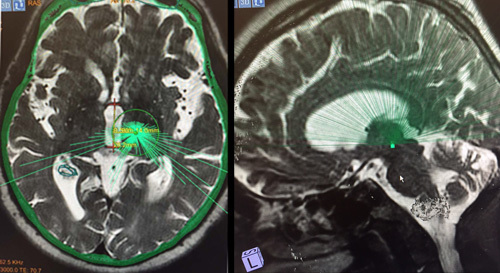 When all 1,000 beams reached that lesion together in one tightly focused treatment pulse, the combined energy destroyed the lesion — without damaging any healthy brain tissue. All of this was accomplished without a knife or an incision. My team and I mapped out the target and then monitored the procedure as MR thermometry measured the temperature at the target site; it automatically adjusted the energy emanating from each of the 1,000 sources so that precisely the right amount of energy reached only the target, without affecting any of the nearby structures or the rest of the brain. We knew that no single wave was damaging any brain tissue, but that the sum of the energy from all of the hundreds of different waves focused on the target was enough to eliminate the problematic region. As a result, the patient’s tremor improved within seconds of reaching the right temperature at the exact spot in the brain responsible for this problem. This new technology is the result of a unique partnership among Weill Cornell Medicine, the Departments of Neurological Surgery and Radiology, and Weill Cornell Imaging. It’s exciting not only because this provides a non-invasive treatment option for essential tremor, but also because of the potential for this technology to disrupt the blood-brain barrier. In our laboratory, we have already used focused ultrasound to briefly open this barrier, which normally prevents substances from going from the blood into the brain, and have precisely delivered gene therapy agents into the specific brain targets with a simple intravenous injection. This has implications for Parkinson’s disease, brain tumors, and other disorders. These are exciting times in neuroscience, with new advanced treatments being developed at a rapid pace. Over the past 15 years, the Department of Neurological Surgery at Weill Cornell has led a revolution in the treatment of neurological diseases, from the first application of gene therapy to the human brain to pioneering work in new applications of brain stimulation and use of precise lasers for certain forms of epilepsy, and now this. Ultrasound to treat tremor without surgery, gene therapy to change brain function in Parkinson’s disease, and lasers to eliminate sources of epilepsy truly sound like science fiction, and yet they are all examples of the cutting-edge treatments being brought to our patients. I am proud of Weill Cornell Medicine for taking the lead on this new technology, and delighted that my patient went home today healthy and happy, and able to drink without spilling a drop and write his name for the first time in a long time. See the news report about this new procedure, with a video showing how it works.